Really, CNN? You're Hot With Donna Brazile, but Cool With Corey Lewandowski Being on Trump's Payroll? Donna Brazile responded to headlines regarding her resignation from CNN—in light of leaked emails showing her providing the Hillary Clinton campaign with debate questions—in familiar, black-auntie fashion. Brazile quoted Michelle Obama’s “When they go low, we go high.” She invoked Martin Luther King Jr. She thanked people for their prayers, in some instances, in a sweet, cutesy way tied to Halloween. 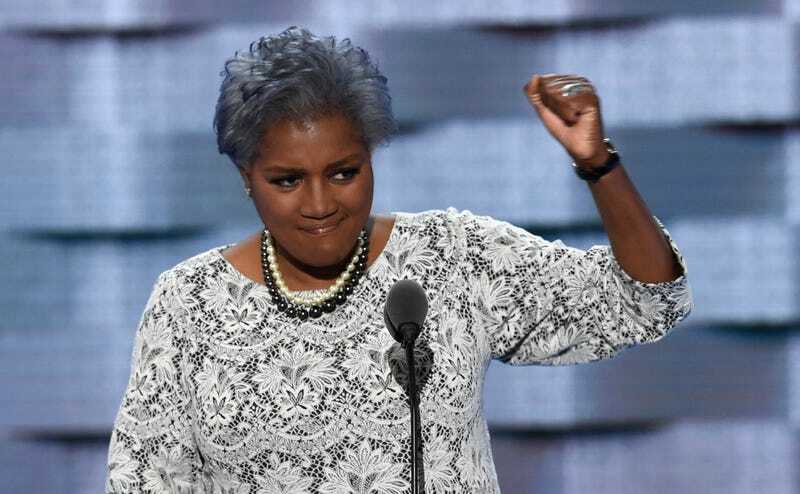 And when responding to others who'd heard about her leaving the cable news network, she tweeted lyrics from “Ain't Gonna Let Nobody Turn Me Around.” Brazile also got back to the business of criticizing GOP presidential nominee Donald Trump and pushing for Democrats to vote. However, as much as I have enjoyed Brazile on television—she doesn’t give way to CNN’s format of verbal pro-wrestling and is extremely Louisianan on all fronts—when it comes to what sparked her resignation, it’s not fine-fine-fine-fine-fine-fine (whew). “Her family has lead poison and she will ask what, if anything, will Hillary do as president to help the ppl of Flint,” Brazile wrote to John Podesta, the Clinton campaign chairman, and Jennifer Palmieri, Clinton’s communications director. Nonetheless, to quote Real Housewives of New York star Luann de Lesseps, this was a very “uncool” thing to do, Ms. Brazile. That said, if you were scheduled to debate in Flint and didn’t anticipate being asked about the poisoned water, you likely can’t put on a pair of pants without supervision. Moreover, much of the leaked emails have exposed nothing but much of what we already knew about how political parties work—notably that when a longtime Democrat like Clinton goes up against a nouveau Democrat in Bernie Sanders, party operatives side with what they know. Also toss in the tidbit that if you happened to watch any of the debates, Clinton didn’t exactly need much help debating Sanders and his penchant for just regurgitating the word “revolution” whenever called to expound on his policy proposals. But OK, OK: Bad Donna. Bad, bad Donna. She was wrong. She shouldn’t have done that. It was a silly, bad move. I still want to try her gumbo, but for shame. Now that she’s gone, though, it’s still pretty grating to watch CNN play the pious card on this matter. So Brazile is out because she helped Clinton, yet a guy still being paid by Trump who can’t legally speak ill of Trump continues to have a CNN contract to basically play the role of parrot? Vladimir Putin may like to play games with our electoral process, but so does the head of CNN. To wit, Jeff Zucker, president of CNN Worldwide, acknowledged that at least some of the network's coverage was a bit excessive, but the network doesn’t seem to feel too guilty about it, considering that it has helped its bottom line. Brazile might have made a mistake, but CNN is full of it. If it was solely selling itself as infotainment, then the criticism would be less warranted. That is not the case, though, as it continues to present itself as a credible, legitimate, unbiased news organization. But if Donna Brazile is out and Corey Lewandowski remains in, the network reeks of hypocrisy and carries the stench of bias for Donald J. Trump.